During the last decade, sports have underwent a huge transformation and came in trend, unlike any other time. What started as first as the sports culture, included a particular dwelling or a club as the sports club, and people, mostly sports enthusiasts and those who were concerned about their fitness, joined those sports clubs. This has now changed to home-based sporting. People with different fitness regimes used to those join those sports clubs to stay fit, and at the same time, to socialize with likeminded people. But, with time, many practices transformed and so did the sporting choices too. Along with sports clubs, which used to emphasize on particular sports like table tennis etc., also underwent the same transformation. People wanted to have sporting accessories of their own to save time and fees of these clubs. This was the time when outdoor sports started moving indoor. With sporting devices at home, it was easier to practice them at one’s will throughout the day. Similarly, table tennis enthusiasts wanted to own a table-tennis table in their homes to play their favorite sport whenever they wanted. On the Table, without Any Time-Table! Even though buying a table-tennis table of one’s own choice is a one-time big investment and surely it needs the availability of ample space inside your dwell to accommodate one, but still, it certainly shirks you off from the heavy club fees and time restraints to play your favorite game. 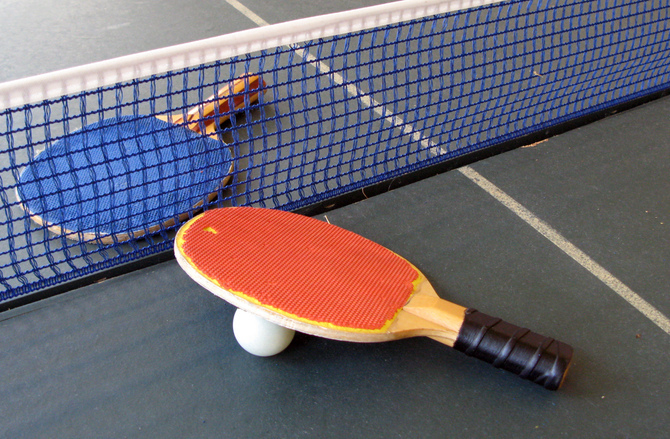 Owning a table-tennis table should mean a lot to any table tennis enthusiast. He can practice his favorite game at his own will, whenever he wants, and has complete freedom of choosing his partners in play. Moreover, it ensures ‘more than normal’ practice time, because the player has no particular time-quota to play the game he loves. He can enhance his skills as much as he likes with ultimate freedom. The willing buyers might worry about the cost of owning a table-tennis table. It is not a hefty purchase though and the internet marketplaces are like a boon for the table tennis enthusiasts as these tables come at greatly convenient prices here. These also come in various ranges and sizes to befit the needs and space availability of the owners. Thus, a needy buyer can buy it without having any second thoughts. A table tennis table does not require a huge deal of maintenance. Instead, it demands minimal maintenance for lasting long. To ensure longevity of the table, it is recommended to cover the table completely, when not in use, for protection from dust. Velvet layer on the tables does not last long from dust. So, that particular layer of cloth is essential for flawless practice of the game of table tennis, as the projectile of the ball somewhat depends on the velvet cover. Apart from the table-tennis table, a few other components are needed to enjoy playing table tennis at home. Those are tennis racket, net and ball. Rackets are not very expensive, and thus, they can be replaced easily, unlike the table-tennis table. The table, being the most expensive component of the game, requires handling with care. The net should not be dragged when putting on and off. And under no condition, should the table tennis table be left outdoor, for it might be inflicted with heavy damage. If the table tennis player grows out of practice, these tables can easily be put to use in other homely needs for their huge length and breadth. You can easily opt from a wide variety of such Table Tennis tables from well-known web portals like www.1800sports.in. Camping Ain’t Any Fun Without Apt Camping Equipment!